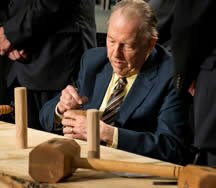 BMH Books author, Dr. John C. Whitcomb, was part of a ceremony in early May that signified the launch of the Ark Encounter themed attraction at Answers in Genesis and the Creation Museum near Cincinnati, Ohio. A full-sized Noah’s Ark is expected to open in the summer of 2016. Dr. Ken Hamm, CEO of Answers in Genesis, recently lauded Dr. Whitcomb, who turns 90 this month, and his co-author, the late Dr. Henry Morris, for their ground-breaking work. Below is a portion of a story that appears on the Answers in Genesis website. Click here to read the complete story. Whitcomb’s BMH collection includes Esther And the Destiny of Israel, Israel From Conquest to Exile, The Bible and Astronomy, The Early Earth (An Introduction to Biblical Creationism), and The World That Perished (An Introduction to Biblical Catastrophism). Fifty-five years after the publication of the classic book The Genesis Flood—which really started the modern biblical creation movement—a full-size Noah’s Ark is projected to open in the summer of 2016 here in northern Kentucky. When the book’s authors, the late Dr. Henry Morris and Dr. John Whitcomb (who turns 90 this month), published their book in 1961, I doubt they could have ever foreseen what would result. Now, there were scoffers back then (as there are today), including from inside the church, who did not see the importance of such a book. For many Christians then (and now), they declared that it was only important to preach the message of salvation in Jesus, and not even write a book about the Genesis Flood. Drs. Morris and Whitcomb, however, understood something vital that many Christians still miss today. The message of salvation through Jesus comes from a Book: the Bible, the very Word of God. Back in the ’60s (and today), the teaching of evolution and millions of years resulted in generations of people not trusting the Book. Now, if this Book can’t be believed regarding its history, then how can it be trusted for its message of salvation—which is based in that history? As they wrote their book, Drs. Morris and Whitcomb understood there was a major issue in the church and culture: authority. Is God’s Word the absolute authority in matters related to origins, or should man’s fallible words be used to reinterpret (and ultimately undermine) Genesis, and thus the authority of God’s Word? As Dr. Whitcomb hammered in his peg, I saw it as highly symbolic. Just as Luther’s nailing of his theses on the church door, the publication of Dr. Whitcomb’s The Genesis Flood was symbolic of nailing a thesis on the door of today’s church. His book was used as a major tool to get the church back to the authority of the Bible, so that the gospel could be more powerfully and effectively presented to the world. As a child I remember Dr. Whitcomb coming and speaking at my church. I remember the books with fantastic creatures I knew of but didn't understand how it fit into what I knew of the Bible. His research and understanding of creation and the Bible continues to impact me as I share God's creation with my children.